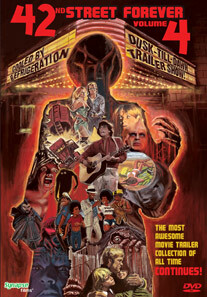 Get ready for the fourth volume of classic exploitation, horror and just plain cool trailers in Synapse Films’ best-selling compilation series. This time we’ve got alien horrors, schizoid psychos, ridiculous comedies vengeful action… and maybe a naked woman or two… all transferred in high-definition! Chill out in front of your television and relive some of the greatest coming attractions of all time! CAN I DO IT… ‘TIL I NEED GLASSES?